The most recent hobby is Alban's. 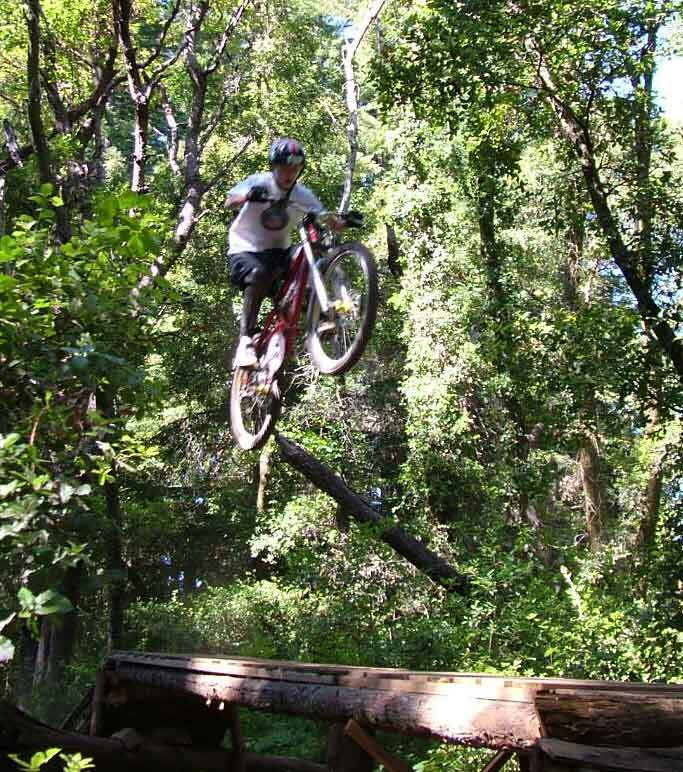 During the spring of 2004, he graduated from soccer and skateboarding to mountain biking, and with his new friend Justin has already participated in three races with hills and drops and jumps and plenty of falls and broken bike parts and all kinds of other fun things for scaring parents half to death! We'd rather he went back to soccer. 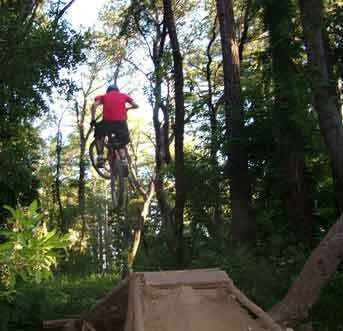 Here he is on the left practicing jumps on the campus of UC Santa Cruz one weekend in May 2004. We have to admit that it looks like fun!  Here's another, this time with no feet. And another, seen from the back. 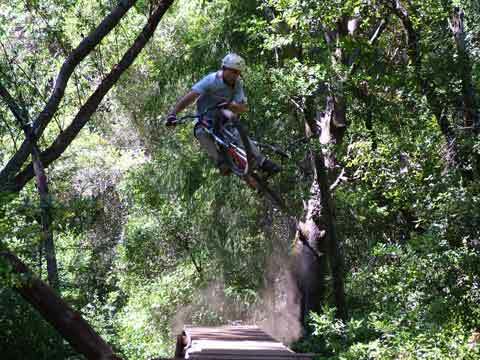 And here is Justin, his mountain biking mentor. Check out the dust! 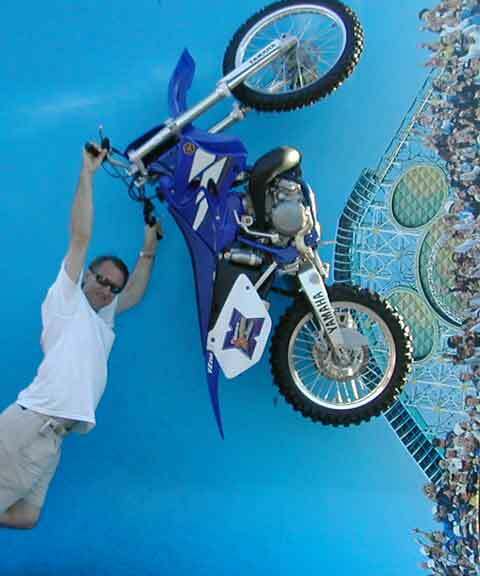 Ian has also gotten into the act, albeit at Disney's California Adventure in Anaheim, as the following photo vividly demonstrates. What style! 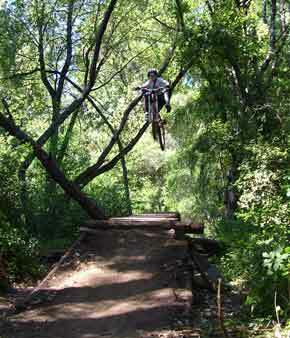 Here is a great picture of Alban that Justin took after they spent a day doing these jumps at UC Santa Cruz. As the years advance, fooling around gets more serious. Other family hobbies include surfing, skiing and swimming pools. Not to forget taking vacations!